Women-in-Combat after 9-11 Does a real soldier sleep with a Teddy Bear? (below, left) A retired Navy Commander writes: "This was the profession that we had chosen. There was no 'weeping.' There was no hand-holding. There was no commiseration and support in any conversations with either our ship-mates or our superior officers. At such times, each carrier pilot looks deep into his own soul and asks, 'Do I still want to do this?' One knows that he has become one of a band of brothers when the answer comes bubbling up from the depths of one's very soul - YES! A loud, booming, resounding YES! It is at that moment that a man knows that he has become one of a band of brothers.… It is almost a blood bond. It is almost genetic. It is strong. It lasts for a lifetime. And it is real. It is not a band of sisters. And it is not a band of brothers and sisters. It is a primal bond that looks to nature for its explanation. It is a 'civilized' human condition. It is a 'warrior' tradition." Girl power "Women join boys in combat, but not without a fight." (ABC report promotes women in combat, but valuable for background information. Includes video.) Should women be trained for war? "Even idiots know better than to put women into combat. I was wrong to blame idiocy. The blame in this case belongs to a category of evil. It belongs to the egalitarian left." The next battle for Pfc. Jessica Lynch "While women may be just as smart, brave and mentally t ough as men, physically they are shorter, lighter and weaker. No amount of physical training can make up for these differences. Therefore, the feminist goal of a genderless society must be achieved by manipulation, intimidation and indoctrination." 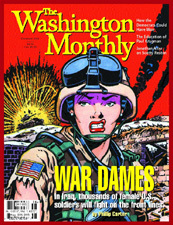 Women in combat From MSN Slate's e-mail dialogue: "I am an Army Officer. I am a male. I have spent the predominance of my military career in Combat Arm's units, which remain segregated. Recently I have been assigned to my first integrated unit since ROTC, and I must confess that my fears have for the most part been confirmed. To begin, it is a myth that there are no women in combat roles…A warrior ethos among our female soldiers is almost nonexistent. As the potential of our current deployment increased, I noted a strong, angry even, resistance to the possibility that they would be expected to deploy, and potentially fight." What kind of nation sends women into combat? "The ridiculous spectacle of rescued POW Pfc. Jessica Lynch, the feisty, ballyhooed warrior of the Army’s 507th Maintenance Company, which was butchered early on in Iraq, occasioned the usual war whoops. Yet no one asked a simple question: What in heaven's name was a hundred-pound girl, barely out of pigtails and high school, doing in a combat zone?" In answer to the question in above article's title… Soviet women in combat The first modern nation to extensively utilize women in combat was the Soviet Union during World War II, when an nearly 60,000 of them fought in the Red armed forces (above, left). As a Communist country, the idea of women soldiers was consistent with Marxist-Leninist ideology, which heaped contempt on traditional morality. These enemies of God considered (as do their contemporary counterparts) the de-feminization of woman essential to achieving the radical quality of the sexes espoused by Karl Marx and other Communists writers. Since the 1960s, many of their anti-Christian social goals have found their way into the social fabric of the United States: Legalized abortion, day care centers (which help destroy the family unit by pushing women out of their homes and into the workforce) and "no fault" divorce all were first tried by a modern nation when Soviet social engineers deemed them useful in communizing Russia. (See "Toward the Total State" for quotes from a modern Marxist acknowledging these as victories.) Today they have be successfully advanced and perpetuated, in the name of feminism, by those promoting a closet Marxist agenda, from Betty Friedan (right, author of the poisonous Feminine Mystique and co-founder of the National Organization for Women) to Hillary "It takes a village" Clinton. (See, for example, "Hillary's global village" and "Parenthood or the village?") Putting women in combat is simply another aspect of the same evil, an evil which, if not checked, will further prepare for the dissolution of the American Republic and our country's entrance into a Soviet-style global tyranny.